Lately, teaching has been real challenging with the end of the school year and the 8th graders struggling to stay focused. While I was sitting here trying to get things accomplished I had a thought. What if we all taught like Andrew Jackson lived his life? I know that Andrew Jackson has his critics and his supporters and that most people either love or hate his guts, but there is one place that all historians agree. 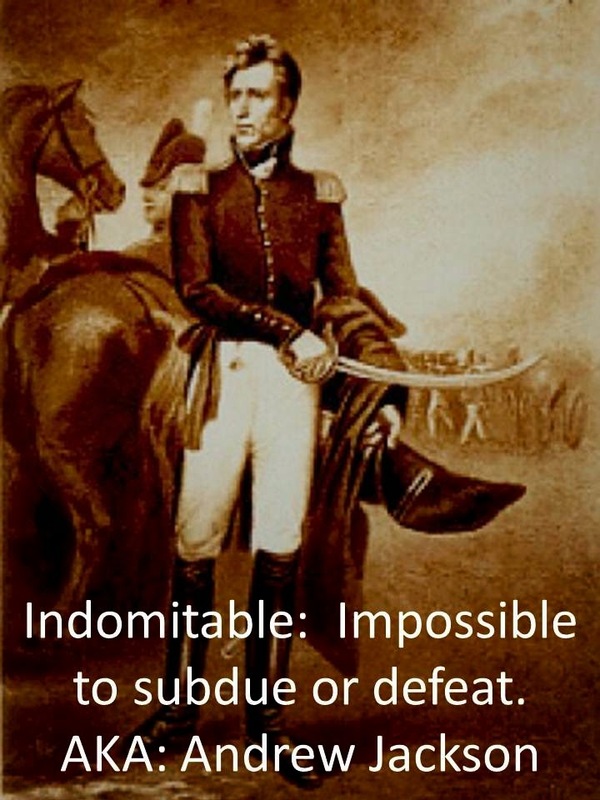 Andrew Jackson had an indomitable will. What Andrew Jackson wanted he always got. It didn’t matter if it was a duel, a show down with some bankers, or a game of chicken with congress. Jackson always won. He didn’t know how to lose. Even bullets didn’t stop this guy from getting what he desired. What if we all taught like this? The image of Andrew Jackson demanding satisfaction from a ten year old in a classroom is comical and kind of scary, but what if we were all indomitable? You will learn this content. You will become more creative because there is no other option. Your grades will go up. Yeah, you just threw a temper tantrum here, but I am still here. I am still your teacher. And, you WILL learn because it is my will. The whining means nothing to me. I know what you must learn and you WILL learn it. Now get to work. I bet that people outside of the classroom would have a whole lot less to complain about and we would probably turn out tons of functional adults. I don’t mean challenging students to crazy duels or losing the basic sense of human decency that allows teachers to connect with kids, but the kind of no frills attitude that makes people perform. When you go back to school think to yourself: What would Andrew Jackson Do? The answer: Lead to get what you want. Student learning and understanding. Disclaimer: Andrew Jackson did some reprehensible things and I am not excusing the bad things he did/treatment of other people. Just that he knew how to lead and get results out of people. Even if some people didn’t agree with what his results were.